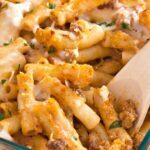 Classic Baked Ziti Noodles are made easy in this recipe with Italian sausage and jarred pasta sauce. Enjoy this comfort food pasta dish on a weeknight, for Sunday dinner, or take it to a potluck! Is there anything better than sitting down to a hot plate of hearty pasta for dinner? It’s especially good when the pasta is smothered in sausage, marinara sauce, and plenty of cheese. That’s exactly what you’ll get with this easy baked ziti recipe, and I’m sure your family will ask for it again and again! This recipe was inspired by a dish I found on Delish. That one is called Easy Baked Ziti, but I wanted to make it even easier for weary cooks like me ;) I subbed in jarred pasta sauce for the crushed tomatoes and tomato paste. I also used ground Italian sausage instead of ground beef. Those substitutions really eliminated the need for extra seasoning since there’s plenty of flavor in the sauce and meat. 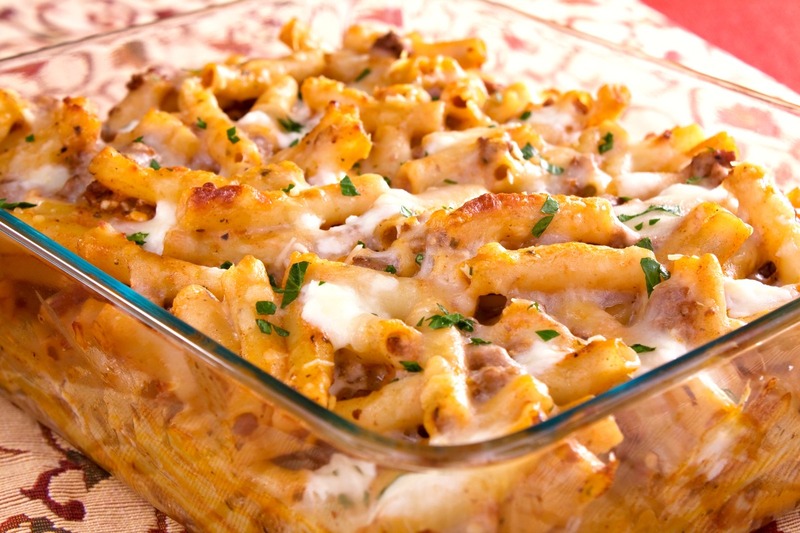 I’m not sure why ziti is the classic shape of pasta for this Italian casserole. Of course ziti is always a perfect choice, but you can also use penne, bow ties, or any other favorite shape of bite-sized pasta. Wagon wheels are always fun! Also, I used cottage cheese in this recipe because I like the texture and find it easy to work with. If you prefer to swap that out for ricotta cheese, definitely go for it! Not only is this a fab family dinner, it also makes perfect potluck fare! The leftovers are tasty too, so you can enjoy it a second night or for lunches during the week. You’ll want to add this classic baked pasta dish to your regular dinner rotations. Just add a green salad on the side for a weeknight meal or Sunday dinner! Preheat oven to 375 degrees F. Bring a large pot of lightly salted water to a boil. Spray a 9" x 13" baking dish with cooking spray or grease with oil, and set aside. Cook pasta one minute less than the cooking time on the package. Drain. Meanwhile, heat olive oil in a deep 12" skillet or dutch oven over medium heat. Cook onion in hot oil for about 5 minutes. Add sausage to onion, and brown and crumble meat until cooked through. Drain fat if necessary/desired. Stir cooked pasta and cottage cheese into meat mixture. Spread about half of the pasta mixture into the prepared baking dish. Spread half of the mozzarella and Parmesan over the pasta. Top with the rest of the pasta, and sprinkle with the remaining cheeses. Cover with foil and bake for 20 minutes. Remove foil, and bake 5-10 minutes longer until cheese is slightly browned. To prevent the foil from sticking to the cheese, spray one side of the foil with cooking spray, and place that side down on top of the casserole dish to bake. 0 Response to "Baked Ziti Noodles with Sausage"